Welcome and thank you for stopping by, my name is Svajunas and I am an amber artisan and here is my story. When you come from Lithuania, you learn about the country’s most revered traditions at an early age. You hear stories from your parents and your grandparents. And if you’re fortunate enough, you sometimes witness one of these traditions in the making. So it was for me with Natural Baltic Amber. As a young child, I became fascinated with Baltic Amber. Frequently referred to as “the gold” of Lithuania, Amber is millions of years old. What could be more incredible than actually touching this substance and knowing that it actually existed when dinosaurs were on the earth! My fascination continued to increase when I held the Amber in my hand and it became warm to the touch. You could turn it over and over and watch it glow in the light, sparking with different colors. I would often walk to the edge of the Baltic Sea where the Amber came to shore and search for my own “gold.” The draw to Baltic Amber, became more than a treasure hunt, it became a way of life. Who I am. For many years I studied the ancient craftsmanship used by Artisans to transform Amber through various stages – from rough stones still sheltered in a thick coating of earth’s residue – to dazzling sculptures and artifacts. As I worked my way through the maze of unique properties contained only in natural Amber, I gained even more knowledge about the intimate relationship that Amber has to the human body in its ability to heal. Little by little, I was hooked. Baltic Amber became my passion. 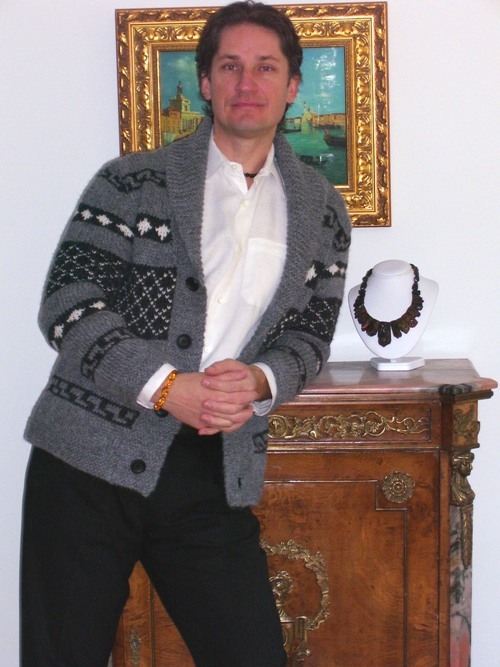 And so it began - my life’s work as a dedication to the Craftsmanship of Baltic Amber jewelry. Finely designed, one of a kind Amber Necklaces and Amber Bracelets in a variety of vibrant colors and various shades of hue from brilliant to opaque. Jewelry that can complement any fashion era and always be complimented on. Necklaces that can be layered to create a multi-strand look or bracelets that coordinate with every color of the rainbow making their own fashion conscious statement. For me as an Amber Artisans, the most compelling aspect of natural Baltic Amber is how these exceptional items of jewelry preserve and Restore Health and Healing. Teething children become calm while wearing a Amber Teething Necklace. People who suffered everything from allergies to arthritis are experiencing a remarkable difference in their wellbeing. Anxiety and depression replaced with calm and purpose. All of these testimonies provide witness to the remarkable synergy that Baltic Amber has with the human body’s own immune system. If you’re looking at journey into the fascinating, visit natural Amber. Explore the opportunity to own one-of-a- kind jewelry creations that make you beautiful – and healthy – from the inside out. I invite you to explore the World of Natural Baltic Amber and what these incredible gems can mean in your life. I welcome your comments and hope to pursue our love of Amber together. Our very best regards and if you have any questions please let us know.